Sardinia, villa for sale in Costa Paradiso, built in the late ’70s, the villa is still one of the buildings that well preserve the style of that times. The house is located in the upper part of the village, facing the north coast of the island. This beautiful property is located inside a well-kept garden of about 3.000 square meters, easily accessible, were we find a rich vegetation typical of the coast in addition to the wonderful pines trees. Through the main gate a paved driveway leads to the villa, in the avenue are available several parking spaces. The villa, arranged on one floor, is staggered on several levels, has got a surface of 200sqm and consists of kitchen with storage, open dining space overlooking the comfortable living area, bedroom and master bathroom. Through an internal patio can reach the other part of the house that includes a double bedroom with private bathroom, the other bedroom and one mere bathroom. The villa also has got also a garage and for the staff is also available a room with bathroom. The property includes about 100 square meters of covered porches with wonderful sea views, a beautiful swimming pool and a tower from which you can see the entire Gulf of Asinara. In the basement of the tower we have a storage room, very useful as a shelter for the pool equipment. This fantastic villa for sale in Costa Paradiso with its spectacular view of the Gulf of Asinara will make unforgettable your moments spent in Sardinia. Bars, restaurants and shops can be reached within few minutes by car. For more information about this beautiful villa for sale in Costa Paradiso contact us as soon as possible. Click here for all the properties for sale in Trinità D’Agultu. 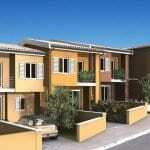 Valledoria: magnificent one bedroom apartment for sale in Sardinia, sea view, beach nearby. Looking to buy new property in Sardinia? Cheap terraced houses in Valledoria, beach at 5 minutes.